“Jimmy Kimmel Live” regularly features segments in which the host elicits funny comments from kids. WASHINGTON – OCA-Asian Pacific American Advocates, a national membership driven organization dedicated to advancing the political, social, and economic well-being of Asian Pacific Americans, has filed a complaint with the Federal Communications Commission (FCC) requesting swift action to address the genocide comments on “Jimmy Kimmel Live’s” “Kids Table” segment. On Oct. 16, the ABC talk show aired a skit titled “Kids Table” in which Kimmel discussed the government shutdown with four children. One child declared that an alternative to solving the United States’ debt to China was to “kill all the Chinese.” This was later picked up by Kimmel as a discussion topic, and the position was reiterated again by the same child and supported by another. “Although Kimmel dismissed the views of the children, such expressions that demonize Asian Pacific Americans are unacceptable,” said Tom Hayashi, OCA executive director. “A pre-recorded segment referencing genocide as a political solution, even stated by children in jest, should never be aired on network television. The producers of the show could not have predicted the response of the children taking part in the bit; however, the Jimmy Kimmel show and the ABC network should have taken responsibility to ensure that such a segment not be aired and that the children co-opted are properly educated on diversity and cultural sensitivity. In addition to filling a complaint, OCA will also be seeking a dialogue with representatives of ABC and the producers of Kimmel’s show. Through the meeting, OCA will request that the producers issue an apology to the children, their families, the viewers, and the Asian Pacific American community; and that ABC include an action plan to prevent incidents such as this from occurring again. 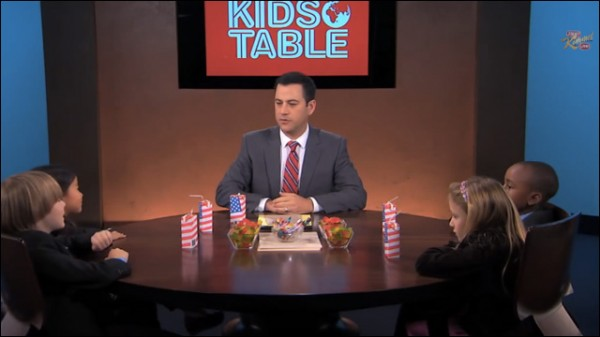 Individuals outraged at the show have created a “We the People” petition calling for an investigation of Kimmel and the “Kids Table” segment. The petition currently has over 35,000 signatures. Additional petitions have also been created on Change.org.